According to several sources, Sherlock Holmes was born on January 6, 1854. He has endured many iterations and will, no doubt, continue to do so as times goes on. Happy Birthday, Sherlock Holmes. 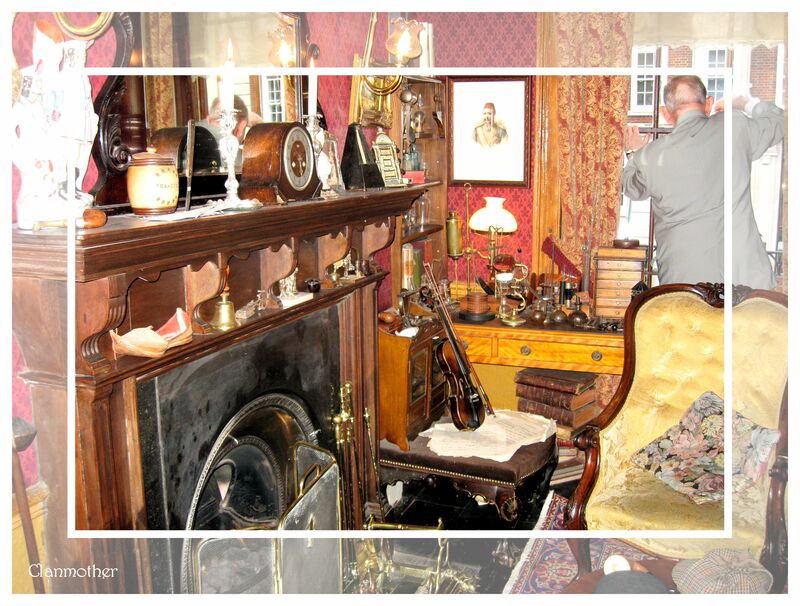 I visited 221b Baker Street in September of 2009 and met Sherlock Holmes. The gentleman, who was sitting in Sherlock Holmes’ chair confided that he came to visit one day and received an open invitation to return because he looked like Sherlock Holmes. His presence gave an authentic ambiance. I like to think that he still visits. Sherlock is looking out the window. My dear friend Happy Easter to you ! May this Easter blessed with love , joy and happiness. OMG really??! I love ACDoyle sice I was a baby. Isn’t it remarkable how Arthur Conan Doyle continue to inspire new generations. Grazie per aver visitato il mio blog e per i vostri commenti. Alcuni anni fa è andato in Italia per studiare la lingua italiana. Ho ancora molto da imparare. Avere un giorno meraviglioso. I would love to go visit there one day!! Now as for Dr. Watson, I know less about him – but maybe that is just me 🙂 I am glad to have found this blog by you, R!! Interesting post and comments. I enlarged the photo of the room with all the memorabilia–an interesting study, as well. I understand that all detective and mystery adventures learn their very important methods and insights from Mr. Holmes. Oh Dina, I loved “The Imitation Game.” It was a story that needed to be told. And it was told brilliantly. Big Hugs coming back your way…. Girl with a Pearl Earing und andere Schätze vom Mauritshuis Museum in den Niederlanden. I must read “Memories and Adventures” The man who invented Sherlock Holmes must be a interesting man–totally! Thanks for the suggestion. He was very complicated. I’m looking forward to reading his autobiography. Unlike Sherlock, I do not “abhor the dull routine of existence.” Now and then a simple, routine day is exactly what I crave. Love the photos. His house looks almost as cluttered as one might expect. He is a favourite in our household as well. There is a book on my shelf that is waiting for me – “Memories and Adventures” by Sir Arthur Conan Doyle, which is his biography. I must open the pages. Thank you so much for stopping by – very much appreciate. It’s called Sherlock Holmes and the Case of the Jersey Lily (Full details below). About 10 days ago I took over the administration of our play’s two Facebook pages. Yesterday I saw your post on Sherlock’s Birthday on your On The Road Book Club and I am sharing a link to it today to the almost 6,000 people that see out posts! Just wanted to let you know. Here are the links to our two Facebook pages for our play “Sherlock Holmes and the Case of the Jersey Lily”. We have posted a lot of cool photos (more to come) as well as some of our great reviews and a picture of the playwright, Katie Forgette with her Bio. I would love for you and the boys to come see the show if you can before it closes. I think you might really enjoy it. It is a stellar cast of Vancouver’s award winning actors. We are filming the performance tonight with multiple cameras as a teaser trailer for getting a broadcaster involved for a two-week on-location shoot, as we have also gotten the television and film rights. Dear Dr. Watson! I am so very glad that you stopped by for a visit! Without you, we would not have known the greatest mind in history (in my opinion). an open invitation to return, I love that, what a great story! Sounds like it was a very interesting visit indeed. I would love to come across that man. Wonderful! Excellent post!!! Happy New Year! When I stepped through the doors, I had the strangest feeling that Sherlock Holmes was indeed a actual figure in history. His name has become a a household word, but I think the greatest legacy comes from the brilliance of Sir Arthur Conan Doyle. Consider how Sherlock Holmes’ method of deductive reasoning has changed the way we approach criminal investigations. How interesting that your mother shares Sir Arthur Conan Doyle’s birthday. Thank you for stopping by! Happy New Year – looking forward to the year ahead. You will have to go back and see! Or perhaps one can visit him via Skype. Would Sherlock approve of Skype do you think? I think that anything and everything is possible considering the many portrayals of Sherlock from Benedict Cumberbatch to Ian McKellen, to Robert Downey, Jr. Sherlock Holmes has gone global with Kōichi Yamadera playing Holmes in Japan. And yet, no matter the iterations, Sherlock Holmes remains ever universal and timeless.